It does not matter how perfect the 3D model is if the 3D printer cannot replicate that level of detail. If you compare the quality scanning systems can produce vs. the quality 3D printers can produce, 3D scanners are far ahead. Four factors influence the quality of the figurine when it comes to 3D printing it: the printer type, the size of the figurine, the proper functioning of the 3D printer and the post-processing done to the figurine. Printer type. As of the time of writing this guide, the printer that is capable of producing the highest quality 3D prints is the Projet 660 made by 3D Systems. All other 3D printers produce comparatively disappointing 3D prints. Size of the figurine. One way to increase the quality of a figurine is to increase the size of it. By increasing the size of the print, you increase the number of color drops and layers that go into each feature on the print, which creates far more detailed geometries and far more detailed and crisp colors. 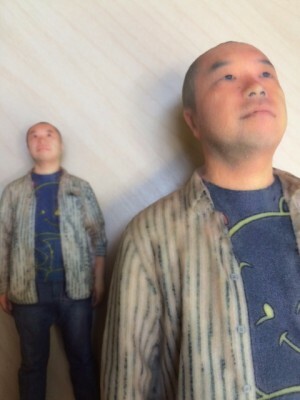 The image below is the same 3D model printed at 2 different sizes. No, the figurine on the left is not out of focus – that is the actual quality the 3D printer produces at that small of a size. Proper functioning of the 3D printer. The same 3D model printed on the same printer multiple times will yield different results each time because the 3D printer is a finicky machine that needs to be cared for properly. If the 3D printer does not function as it is supposed to, any number of problems will result that will significantly degrade the quality of the 3D print. 3D printer operators with the most experience tend to be able to produce the best quality 3D prints because they understand how to care for and calibrate the 3D printer. Ensuring the 3D printer operator has strict quality control guidelines is also important. Figurine post processing. It is possible to fix certain figurine problems through post processing techniques such as sanding the model or applying a specialized coat to the model. It is also possible to create a smoother or otherwise more aesthetically appealing surface quality through post processing techniques. We recommend working with only experienced 3D printer operators because they are the ones with the strongest post processing capabilities.